Posted on March 16, 2018 by Elizabeth E.
We escaped to Texas last week, to visit our son and his family, as well as head to San Antonio, where my husband participated in a scientific conference. So I tried to grab some undistracted time with my grandsons; Alex and I made a Lego sewing machine. “When things come at you very fast, naturally you lose touch with yourself,” noted Marshall McLuhan, over a half-century ago. Posted on June 26, 2011 by Elizabeth E.
I’ve been in Washington, DC this past week, visiting friends. My sister joined me for one day (one MUGGY day) so we stayed in the National Gallery of Art for the most part, taking it all in. But everywhere I went, I saw the grid. The underlying architecture of the quilting world, even if we distort it, or break it, or deconstruct it. 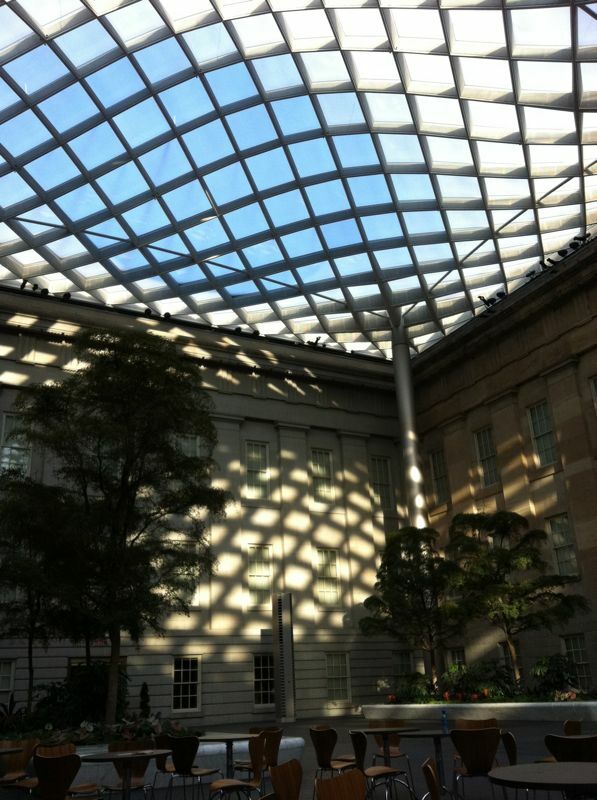 The roof of the National Portrait Gallery, and the wall of the courtyard that caught the light. 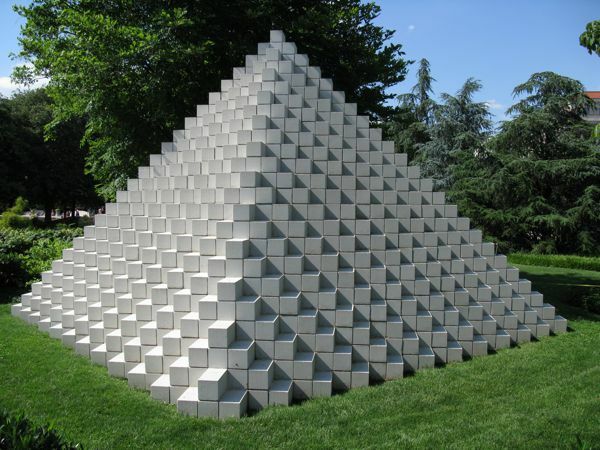 Sol LeWitt’s stack of blocks. Almost looks like a bunch of HST there on the right side. Good luck with the left side. I spent one day with Rhonda, one who joined in the Red/White Challenge and who took me to the Lorton Workhouse where we enjoyed a lovely day filled with all sorts of inspiration and art. 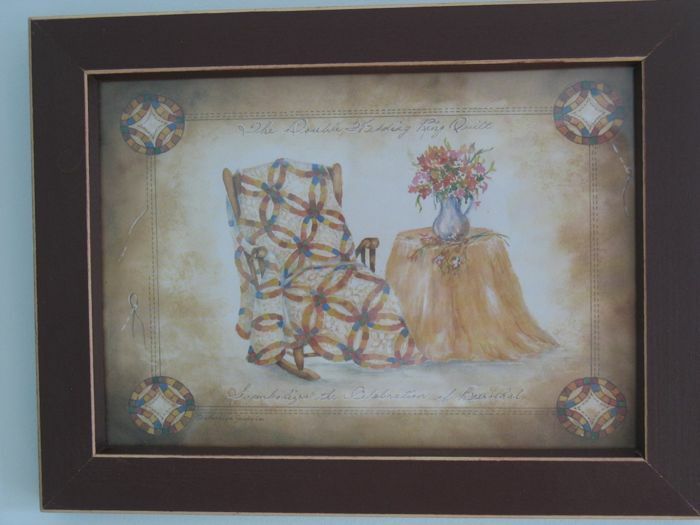 We saw a watercolor of a lovely pot of flowers by Marni Maree and the title was Sixteen Things About Me. Sure enough, we could spot little artifacts that represented her hidden in her painting. So Rhonda and I got thinking about doing a small quilt, but lowering the number to say, ten objects, working them into our designs. 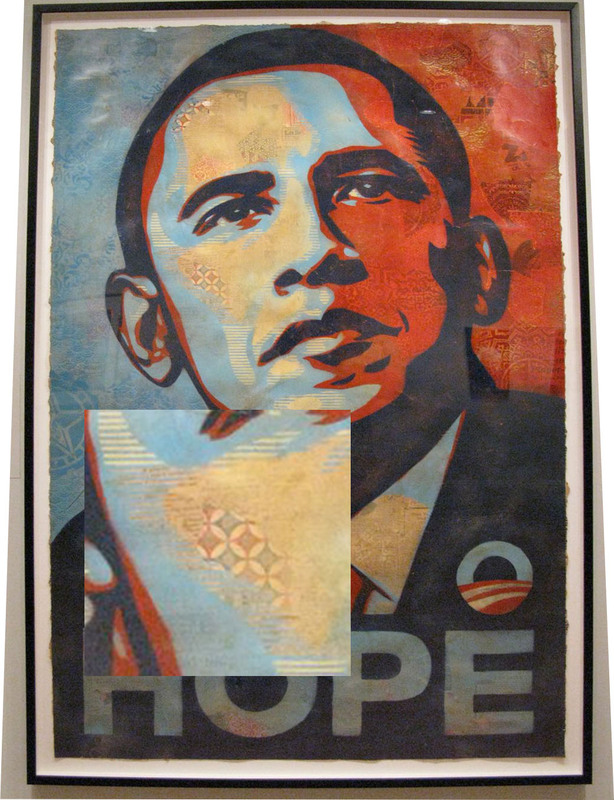 In another gallery we saw a quilter who made extensive use of raw-edge applique. So we added that “rule” to the budding challenge we were thinking up. But we stopped short of deadline or any other rules, because she’s working on the dotty quilt I have waiting for me to finish with (yes, I got it back from the quilters), and then we’re already doing the appliqued Lollypop Tree blocks together. The goal: one a month. But if you think you’d like to join us in this idea of a challenge, leave a comment and propose a size. Maybe we’ll move it up in the queue. Or maybe it sounds like a lovely thing to do NEXT spring. Afterwards we enjoyed lunch together in Occoquan, Viriginia at the Blue Arbor Cafe, where I had an amazing lobster roll. Tons of lobster, but as terrific as that was, the time visiting with a good friend was even better. Here are all the red/white blocks together so far. When we were traveling, we stopped the mail, but it gets delivered tomorrow, so I can then wash and iron the red fabric and get my blocks done! Posted on July 8, 2010 by Elizabeth E.
I just returned from a trip to eastern Canada and I was interested in the amount of quilts and quilting that I noticed in Nova Scotia. 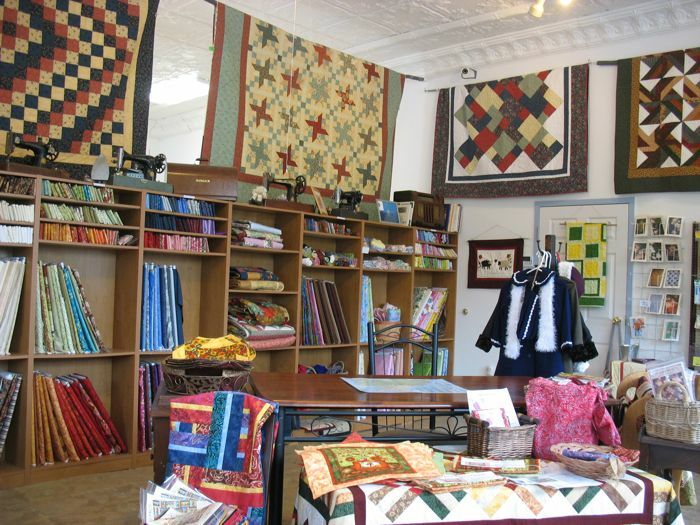 On our way to the Anne of Green Gables House, we stopped for lunch at the Prince Edward Island Preserve Company and there were quilts hanging from the ceiling. I was pretty amazed because around here, nobody does this. 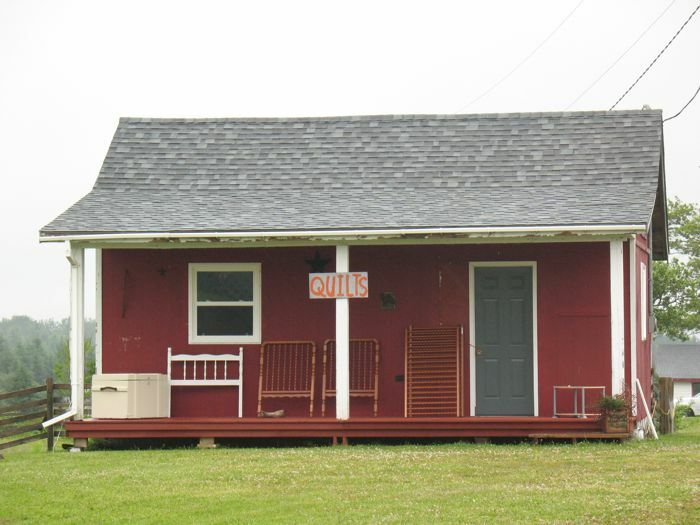 It was the first taste of the frequency with which I would see quilts advertised, either in quilt shops, or in gift shops, or just a lone sign tacked to a front porch: Quilts. 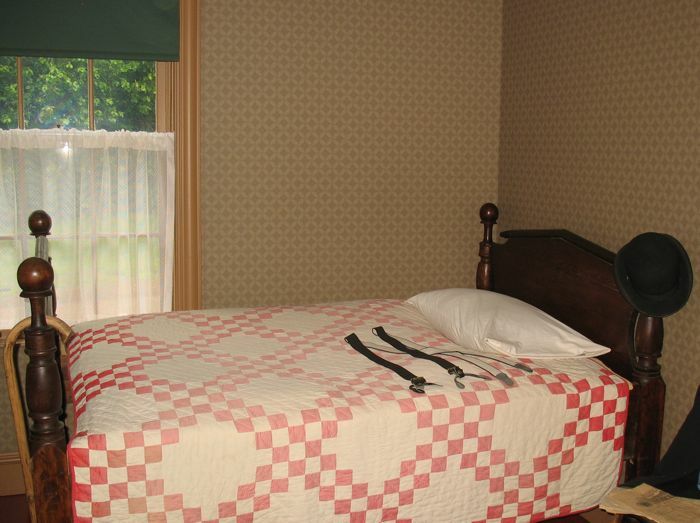 While it is traditional to use quilts in turn of the century houses, I enjoyed seeing what the curators of the Green Gable House had used. One little girl, upon seeing this, said “Oh, this is Matthew’s bedroom.” Her fusion of the fictional with the real was a theme I heard from other visitors to this home. 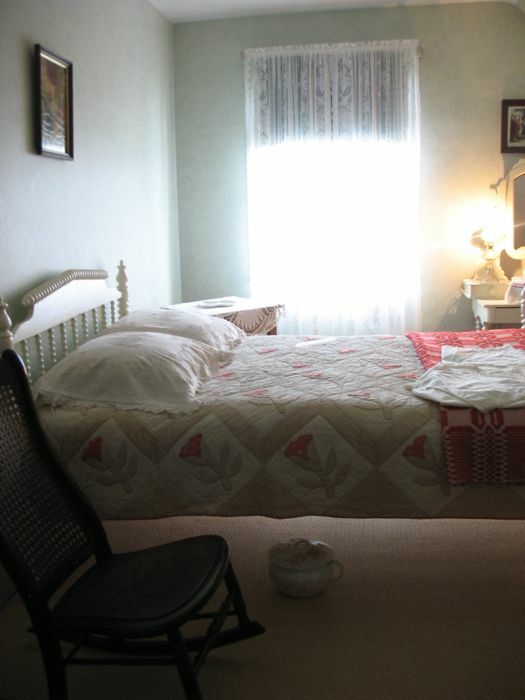 Another bedroom in the house, complete with chamber pot. 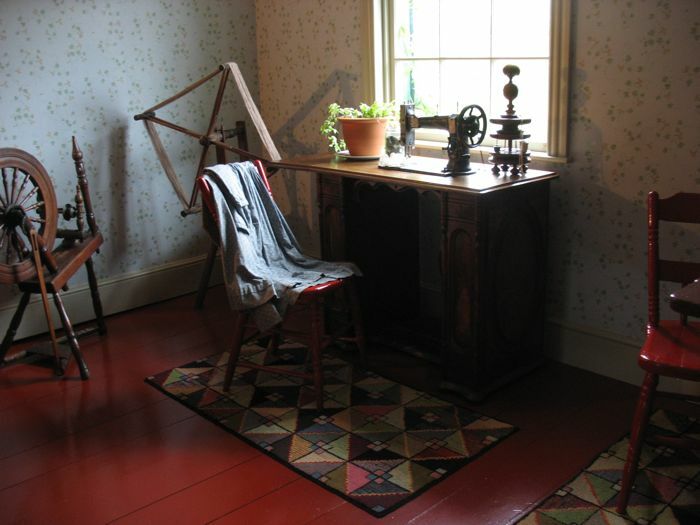 Even though everything about this home is fictional (Anne never lived here, nor did the author of the series–it belonged to her grandfather’s cousin and she only visited the house) I still enjoyed seeing the “sewing” room. A hand-hooked rug is on the floor in front of the machine. 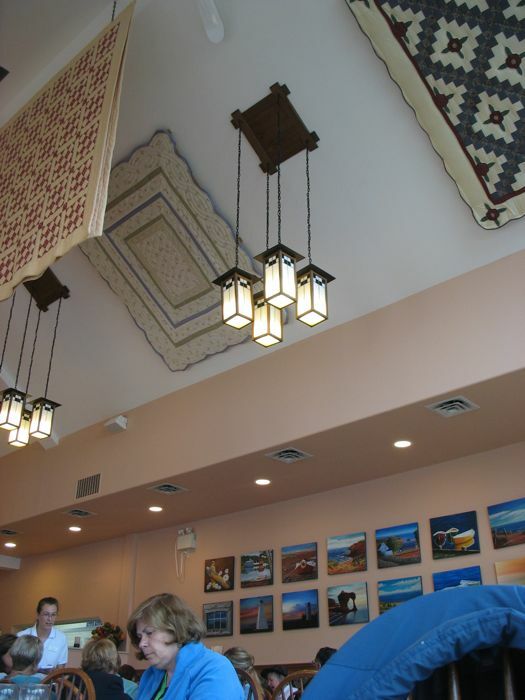 I saw these rugs all over this area–it’s a traditional craft–and to me it’s the quiltiest thing about this room. On our way out to the outer edge of Prince Edward Island, we saw this sign. As usual, we were pressing on to our Bed and Breakfast and didn’t stop, but this place didn’t look like it was open, either. Quilts and sweaters seem to be popular items for sale in this area, a natural considering the weather. 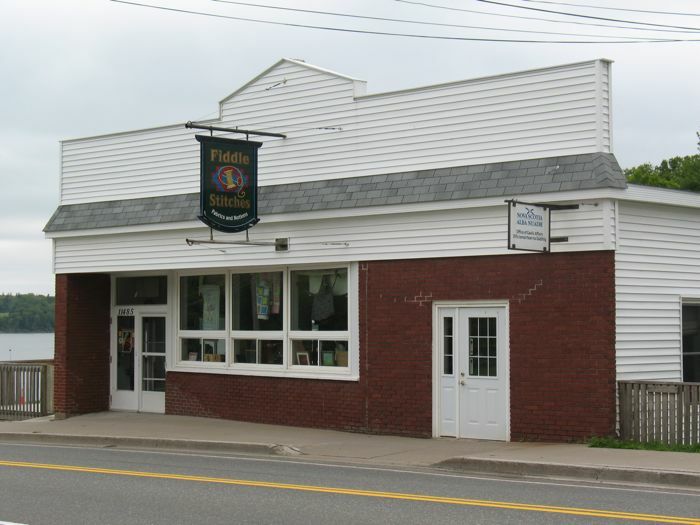 When I mentioned that to the proprietor of Fiddle Stitches, a shop in Mabou (photo above) she nodded. 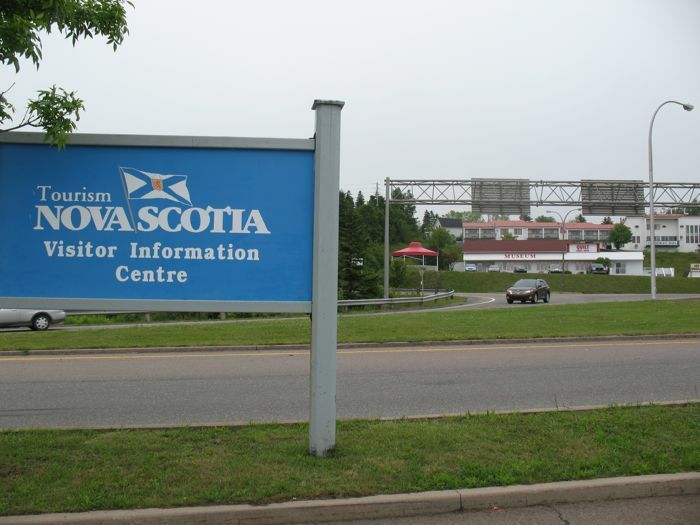 “Oh yes, we’re doing quite well.” Click on this link to go to a listing of shops in Nova Scotia. I found it interesting that there isn’t one in Halifax, the main city on the island. Since available space in my luggage space was tight, I didn’t intend on buying anything–but I did anyway. She was so genial and I found a couple of cottons I liked (of course). 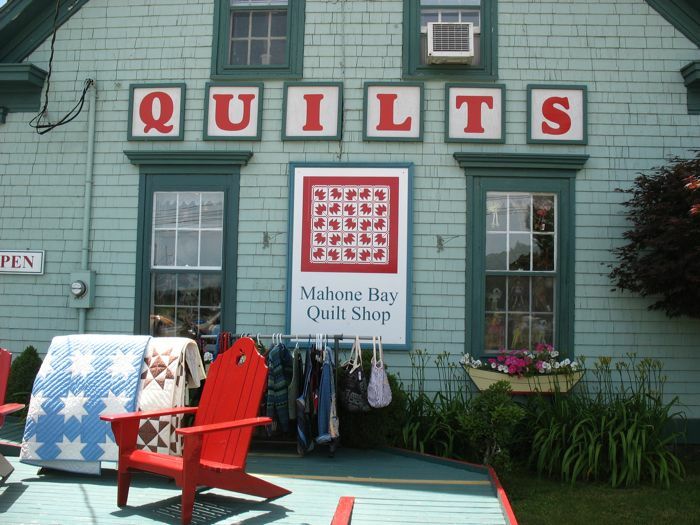 Mabou is known for its style of music played with piano and fiddle, hence the fitting name for this quilt shop. 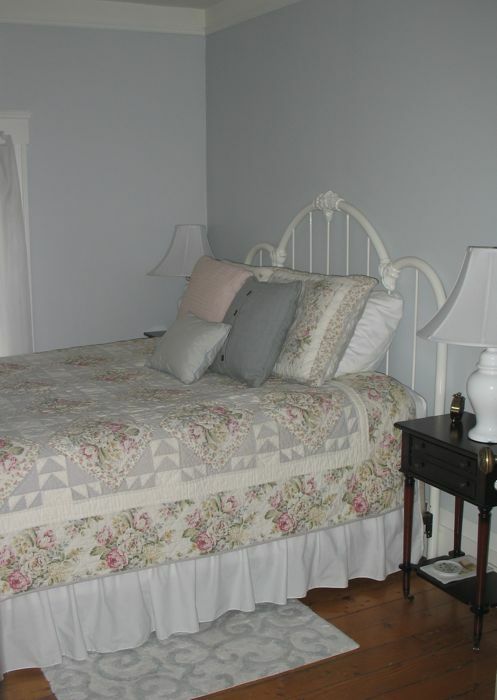 While this wasn’t our bedroom in the Glendyer Inn (a bed and breakfast in Mabou) I snapped a photo of the quilt. Here’s your kitschy quilt-related photo. Hanging in our next B & B on the wall. 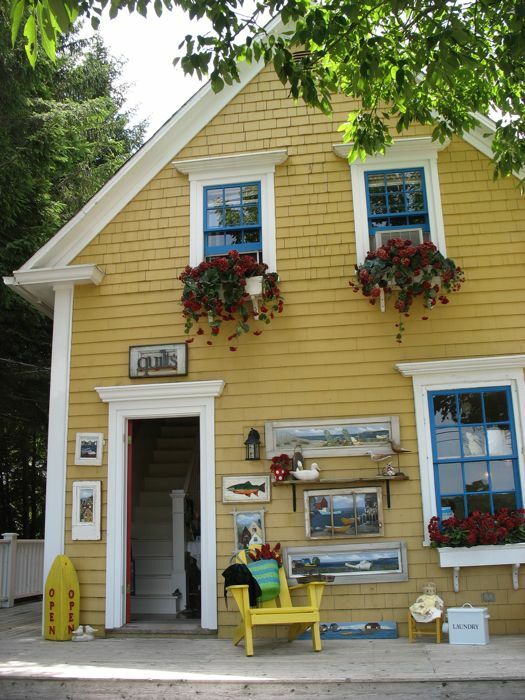 Mahone Bay had a shop that sold quilts, right next to another gift shop (below) that also hawked these wares. Even when I wasn’t seeing quilts, or shops, or places to buy quilts, as a quilter, we always see the pattern in places around us. 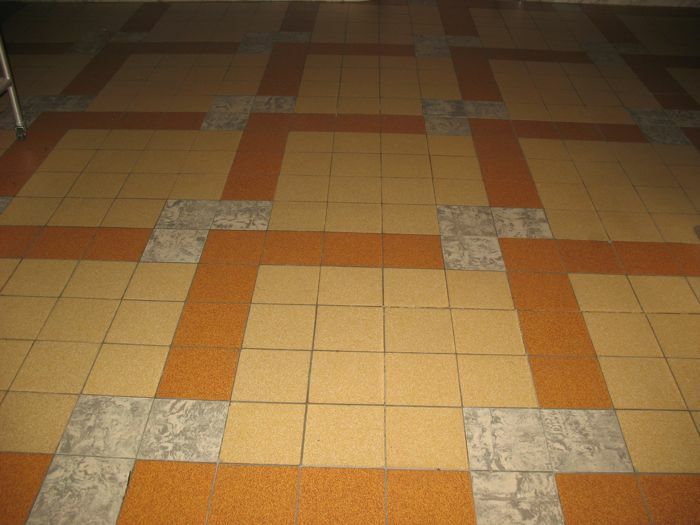 This pattern was the floor of the “Sailor’s Church” in Old Town Montreal. I see a grid and I either start sketching (like I did when I sat in the Anglican Church) or snap a photo. 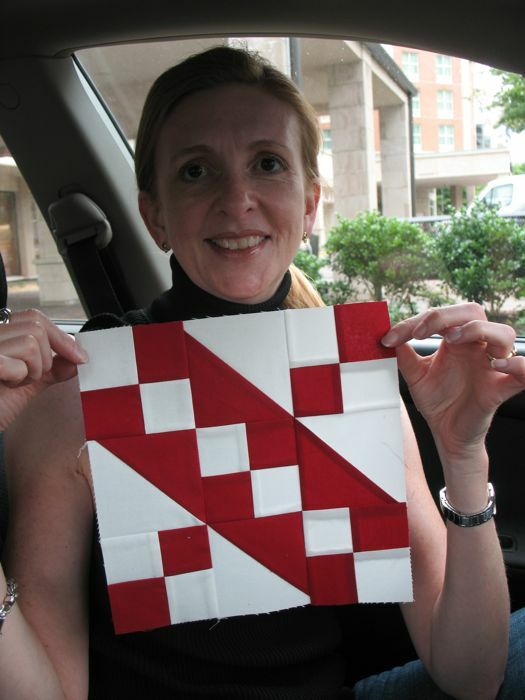 My travel notebooks are full of little gridded out pictures, ideas for future quilts.